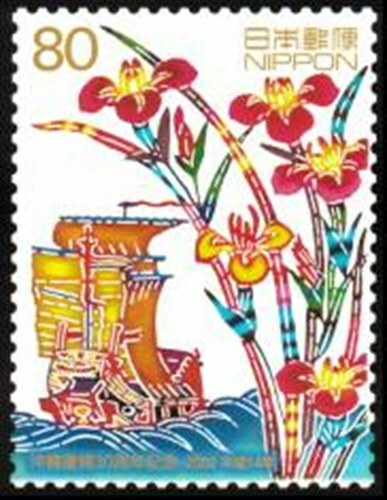 For the 30th anniversary of the revision of Okinawa to Japan in 2008 Japan issued one stamp which shows a “shinkousen” ship and the flowers of an iris. By the stamp is given the “shinkousen” the type of ship used for tribute missions and trading has arrived at Fuzhou (Fujian province) from the Ryukyu Kingdom. 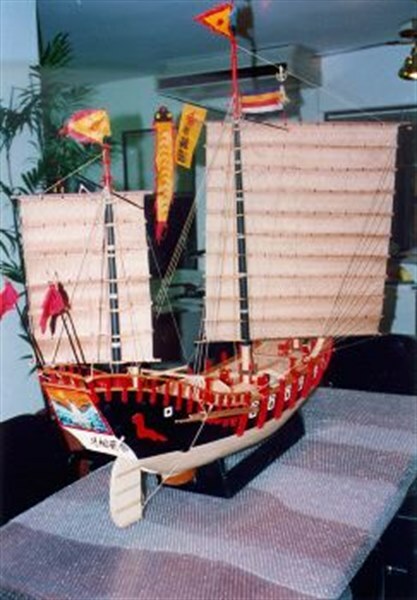 It is a Chinese type junk ship and there were two types the “shinkousen” and “sekkosen” both types were used by the government for the round trip from Ryukyu to China to deliver tribute to the Emperor during the Qing and Ming dynasty in China. The ships did have a length of about 37.5m and a beam of about 9m. Japan 2002 80y sg?, scott?